Notes from the Executive V.P. I get sucked in every time….. 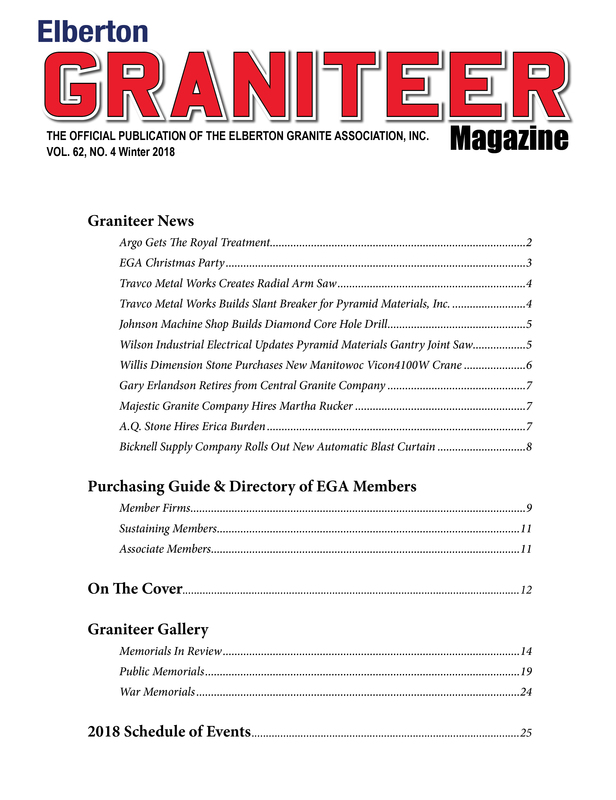 Very often, I find myself looking through the back issues of the Graniteer. Usually, I am looking for something particular, such as the name of someone in the industry 30 years ago. Or perhaps a photo of a quarry that was in operation 50 years ago. Whatever the reason, I should know that once I start looking through a back issue, I am going to get sucked in! The back issues of the Graniteer are just so interesting. 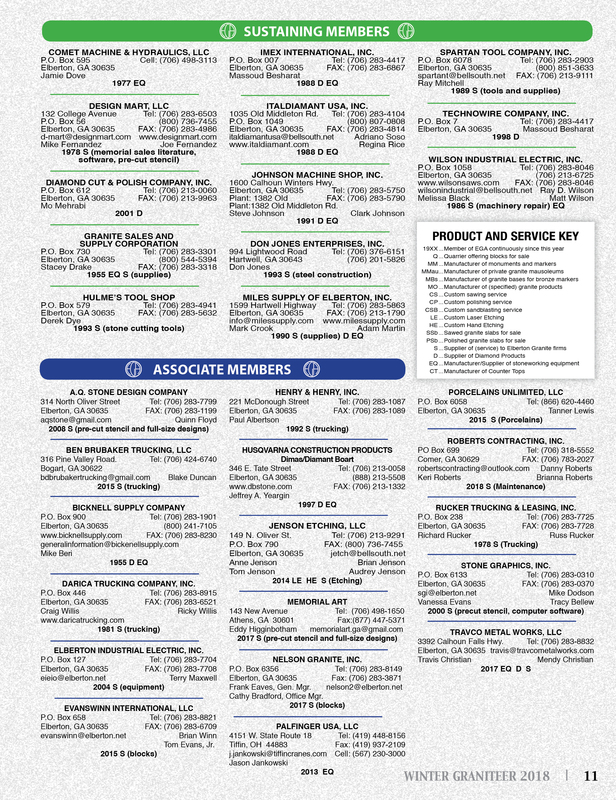 I mean, they are a veritable time capsule of who is who and what has occurred in our industry since 1951. I am always amazed to see the progression of the industry, from the tools and equipment to the facilities and people. Every issue has something that catches my interest, and causes me to think, so, “that’s who started that”, or “that’s who built that”, or that’s why we do that”. My latest venture into the archives of the Graniteer, was a search for some information about the EGA’s downtown display, which I found in the 1970 Summer edition. However, as is always the case, I start looking at the other editions in the same general time frame, (this is where the getting sucked in starts). In the previous edition, Spring, 1970. I ran across a feature devoted almost entirely to the MBNA-AMA convention, which was held in February of 1970, in Atlanta. 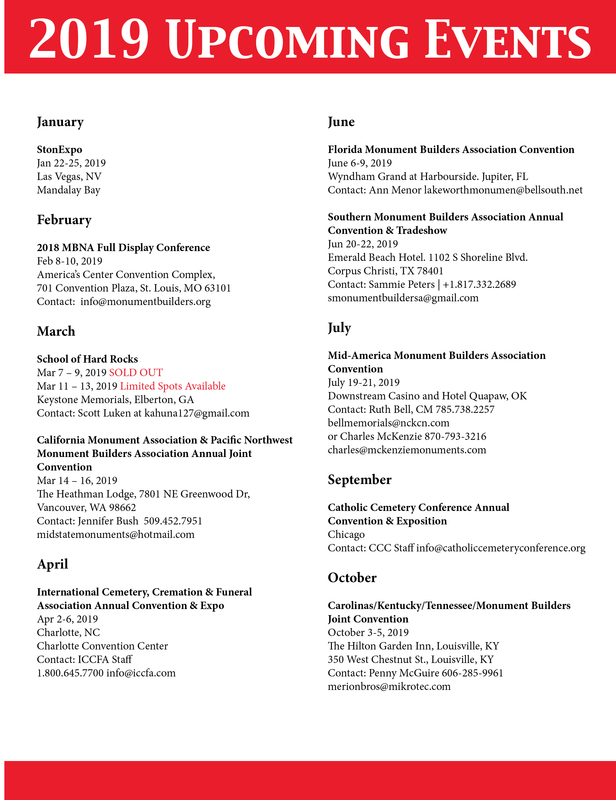 I then got to thinking about the MBNA convention being held in February 2020 in Athens, and I realized how much valuable information I was looking at. 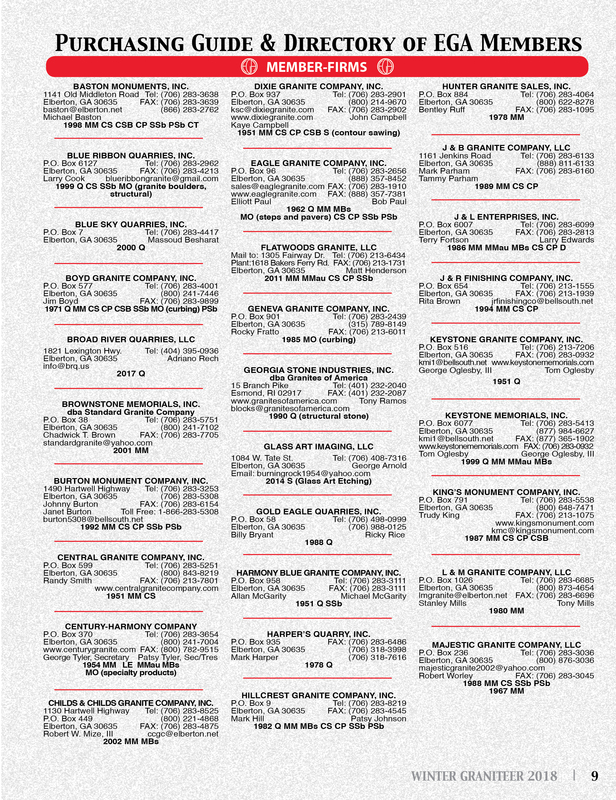 In 1970, the EGA really put on a great convention for their guests, and in 2020, the EGA will do it again. I was able to get so many great ideas from that article that I hope to be able to build upon. As I said, I am always amazed at what I find when I read the back issues of the Graniteer. My predecessors, Bill Kelly and Tom Robinson were marketing experts. I have learned so much by reviewing what they did back in the day and some of the ground work they laid out. As we begin planning for the 2020 convention, we hope to capture some of the inspiration they left us, improve upon it and then add a modern spin on it. If you have some time and would really like a trip down memory lane, get on the EGA website and look back through the archived Graniteers. I guarantee you will find something you had forgotten about, or you will see an old familiar face. Either way, you will get sucked in! I wish you all a prosperous 2019 Graniteer News Argo Gets The Royal Treatment	2 EGA Christmas Party	3 Travco Metal Works Creates Radial Arm Saw	4 Travco Metal Works Builds Slant Breaker for Pyramid Materials, Inc.	4 Johnson Machine Shop Builds Diamond Core Hole Drill	5 Wilson Industrial Electrical Updates Pyramid Materials Gantry Joint Saw	5 Willis Dimension Stone Purchases New Manitowoc Vicon4100W Crane	6 Gary Erlandson Retires from Central Granite Company	7 Majestic Granite Company Hires Martha Rucker	7 A.Q. 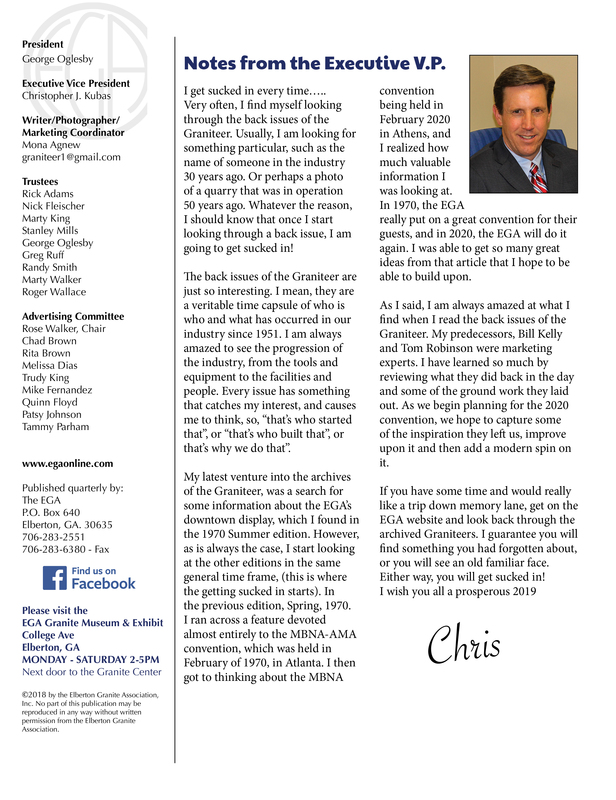 Stone Hires Erica Burden	7 Bicknell Supply Company Rolls Out New Automatic Blast Curtain	8 Purchasing Guide & Directory of EGA Members Member Firms	9 Sustaining Members	11 Associate Members	11 On The Cover	12 Graniteer Gallery Memorials In Review	14 Public Memorials	19 War Memorials	24 2018 Schedule of Events	25 Elberton Granite Association’s Argo Gets The Royal Treatment The United States of America boasts many monuments memorializing a person, a time, a place; Something that is important to those around it; Someone that is worthy of future generations to adore and respect; An event that marks a turning point in our history. 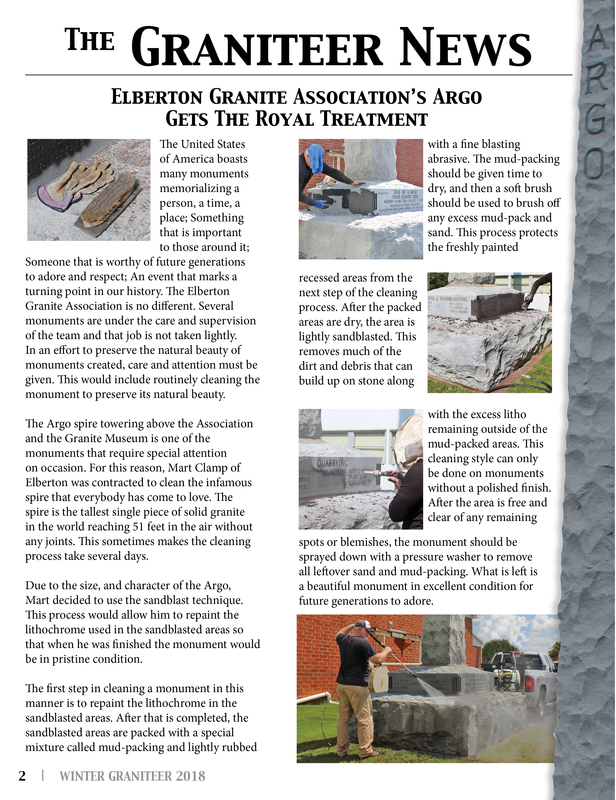 The Elberton Granite Association is no different. Several monuments are under the care and supervision of the team and that job is not taken lightly. In an effort to preserve the natural beauty of monuments created, care and attention must be given. This would include routinely cleaning the monument to preserve its natural beauty. The Argo spire towering above the Association and the Granite Museum is one of the monuments that require special attention on occasion. For this reason, Mart Clamp of Elberton was contracted to clean the infamous spire that everybody has come to love. The spire is the tallest single piece of solid granite in the world reaching 51 feet in the air without any joints. This sometimes makes the cleaning process take several days. Due to the size, and character of the Argo, Mart decided to use the sandblast technique. This process would allow him to repaint the lithochrome used in the sandblasted areas so that when he was finished the monument would be in pristine condition. The first step in cleaning a monument in this manner is to repaint the lithochrome in the sandblasted areas. After that is completed, the sandblasted areas are packed with a special mixture called mud-packing and lightly rubbed with a fine blasting abrasive. The mud-packing should be given time to dry, and then a soft brush should be used to brush off any excess mud-pack and sand. This process protects the freshly painted recessed areas from the next step of the cleaning process. After the packed areas are dry, the area is lightly sandblasted. This removes much of the dirt and debris that can build up on stone along with the excess litho remaining outside of the mud-packed areas. This cleaning style can only be done on monuments without a polished finish. After the area is free and clear of any remaining spots or blemishes, the monument should be sprayed down with a pressure washer to remove all leftover sand and mud-packing. What is left is a beautiful monument in excellent condition for future generations to adore. 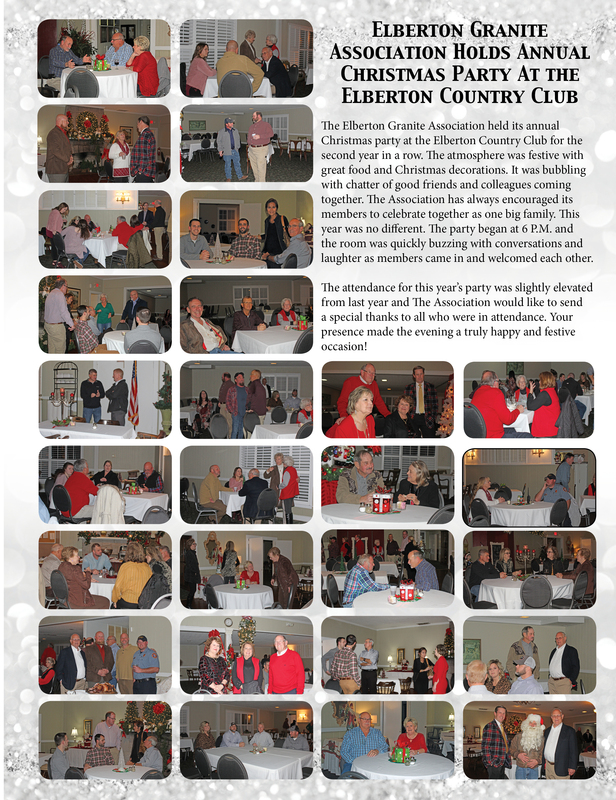 Elberton Granite Association Holds Annual Christmas Party At the Elberton Country Club The Elberton Granite Association held its annual Christmas party at the Elberton Country Club for the second year in a row. The atmosphere was festive with great food and Christmas decorations. It was bubbling with chatter of good friends and colleagues coming together. The Association has always encouraged its members to celebrate together as one big family. This year was no different. The party began at 6 P.M. and the room was quickly buzzing with conversations and laughter as members came in and welcomed each other. The attendance for this year’s party was slightly elevated from last year and The Association would like to send a special thanks to all who were in attendance. Your presence made the evening a truly happy and festive occasion! Travco Designs and Constructs A New Cut To Length Radial Arm Saw Travis Christian, owner of Travco Metal Works designed and constructed this cut to length radial arm saw. The saw features a 7.5 hp motor with variable speed control. Up to an 18” blade can be used, making the many uses of this saw numerable. Fiberglass, plastic, wood and tile are a few of the materials this saw can be used to cut. The blade is set up to have adjustable height for notching and to handle full cuts as needed. The saw was built for two-hand operation to ensure the safety of the operator. Both start buttons on each side of the control panel must be pushed simultaneously to begin cutting. In an effort to control backlash, Travco built the machine with linear guide bearings and it runs on a precision ball screw. In the near future, Travco will be retrofitting the machine to include a fully automatic cut to length option. This will alleviate the need for the saw to have a man stand over it to cut each piece. 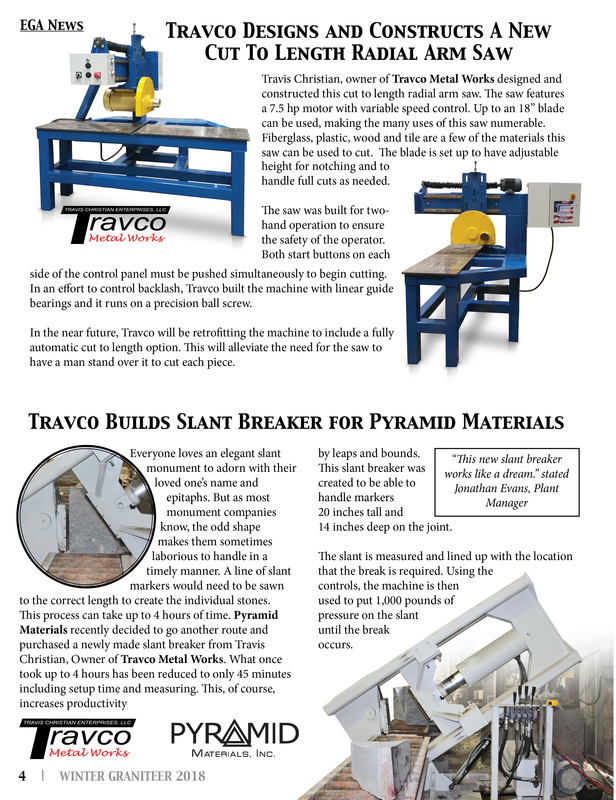 Travco Builds Slant Breaker for Pyramid Materials Everyone loves an elegant slant monument to adorn with their loved one’s name and epitaphs. But as most monument companies know, the odd shape makes them sometimes laborious to handle in a timely manner. A line of slant markers would need to be sawn to the correct length to create the individual stones. This process can take up to 4 hours of time. Pyramid Materials recently decided to go another route and purchased a newly made slant breaker from Travis Christian, Owner of Travco Metal Works. What once took up to 4 hours has been reduced to only 45 minutes including setup time and measuring. This, of course, increases productivity by leaps and bounds. This slant breaker was created to be able to handle markers 20 inches tall and 14 inches deep on the joint. The slant is measured and lined up with the location that the break is required. Using the controls, the machine is then used to put 1,000 pounds of pressure on the slant until the break occurs. Johnson Machine Shop Builds New Diamond Core Hole Drill It seems that there is always something happening at Johnson Machine Shop. The team recently spent a few months working on a project for a quarry located in Oklahoma. They built a Diamond Coring Machine constructed of heavy structural steel. The frame is welded to insure maximum stability and rigidity. There is a complete water and hydraulic system built into the machine. A water supply only needs to be connected to the source for operation. Water is applied to minimize friction and heat while the diamond tipped drill bit cuts into the hard surfaces of the granite. The machine will hold a drill bit as small as 1” and as large as 8”. The 15 HP spindle motor is equipped with variable speed and pressure to ensure fast, economical and clean operation. The built-in motorized conveyor belt is 9 ft. long. The length of the conveyor allows multiple stones to be lined up for drilling. This streamlines production. There is a limit switch installed that will control the depth of the cut. 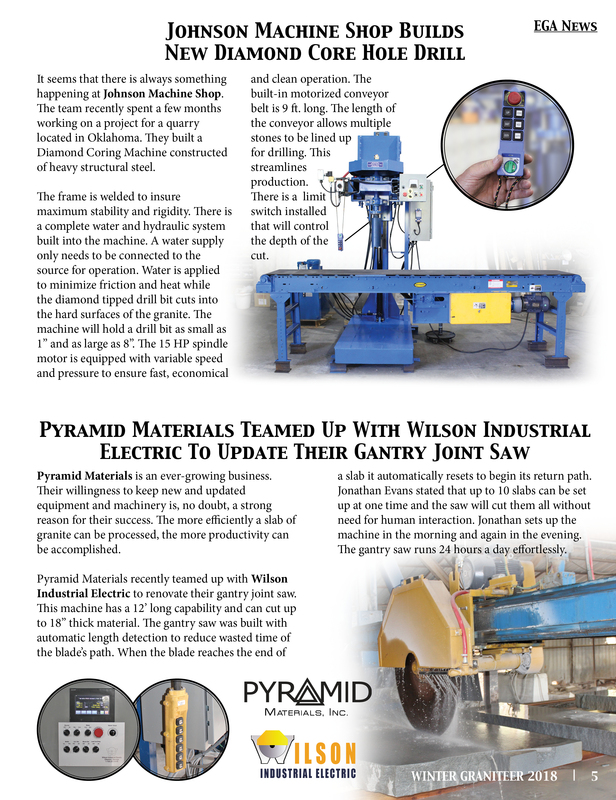 Pyramid Materials Teamed Up With Wilson Industrial Electric To Update Their Gantry Joint Saw Pyramid Materials is an ever-growing business. Their willingness to keep new and updated equipment and machinery is, not doubt, a strong reason for their success. The more efficiently a slab of granite can be processed, the more productivity can be accomplished. Pyramid Materials recently teamed up with Wilson Industrial Electric to renovate their gantry joint saw. This machine has a 12’ long capability and can cut up to 18” thick material. The gantry saw was built with automatic length detection to reduce wasted time of the blade’s path. When the blade reaches the end of a slab it automatically resets to begin its return path. Jonathan Evans stated that up to 10 slabs can be set up at one time and the saw will cut them all without need for human interaction. Jonathan sets up the machine in the morning and again in the evening. The gantry saw runs 24 hours a day effortlessly. 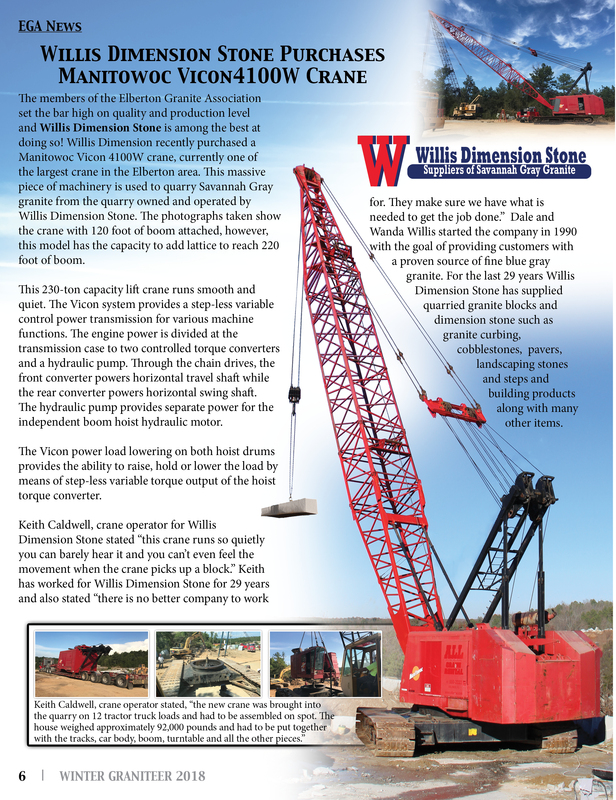 Willis Dimension Stone Purchases Manitowoc Vicon4100W Crane The members of the Elberton Granite Association set the bar high on quality and production level and Willis Dimension Stone is among the best at doing so! Willis Dimension recently purchased a Manitowoc Vicon 4100W crane, currently one of the largest crane in the Elberton area. This massive piece of machinery is used to quarry Savannah Gray granite from the quarry owned and operated by Willis Dimension Stone. The photographs taken show the crane with 120 foot of boom attached, however, this model has the capacity to add lattice to reach 220 foot of boom. This 230-ton capacity lift crane runs smooth and quiet. The Vicon system provides a step-less variable control power transmission for various machine functions. The engine power is divided at the transmission case to two controlled torque converters and a hydraulic pump. Through the chain drives, the front converter powers horizontal travel shaft while the rear converter powers horizontal swing shaft. The hydraulic pump provides separate power for the independent boom hoist hydraulic motor. The Vicon power load lowering on both hoist drums provides the ability to raise, hold or lower the load by means of step-less variable torque output of the hoist torque converter. Keith Caldwell, crane operator for Willis Dimension Stone stated “this crane runs so quietly you can barely hear it and you can’t even feel the movement when the crane picks up a block.” Keith has worked for Willis Dimension Stone for 29 years and also stated “there is no better company to work for. They make sure we have what is needed to get the job done.” Dale and Wanda Willis started the company in 1990 with the goal of providing customers with a proven source of fine blue gray granite. 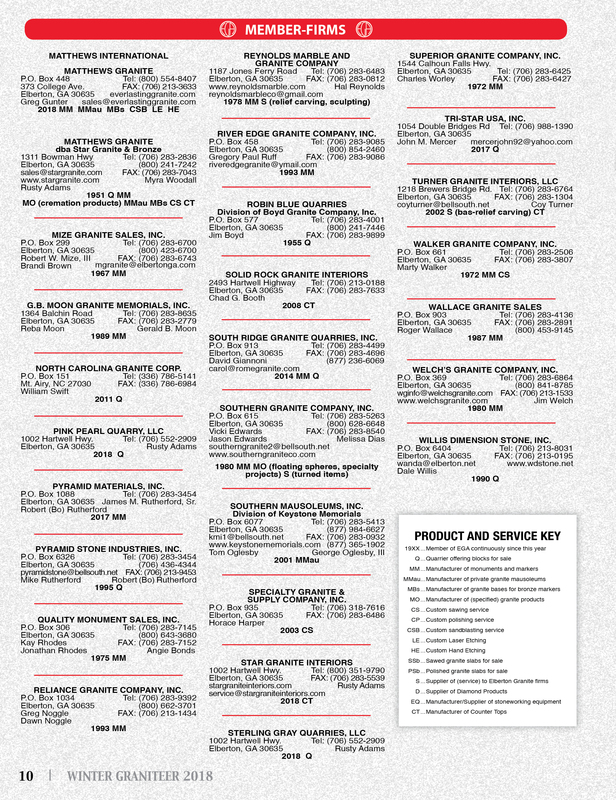 For the last 29 years Willis Dimension Stone has supplied quarried granite blocks and dimension stone such as granite curbing, cobblestones, pavers, landscaping stones and steps and building products along with many other items. Central Granite Announces the Retirement of Gary Erlandson Central Granite Company, Inc. announces the retirement of Gary Erlandson, employee of fourteen years. Gary oversaw operations administration and safety for the company. In his fourteen years he functioned as an employee, a consultant and a contractor. He is looking forward to having more time to spend with his family and to ride his bike. Gary enjoys bicycling from town to town to keep fit and stay healthy. 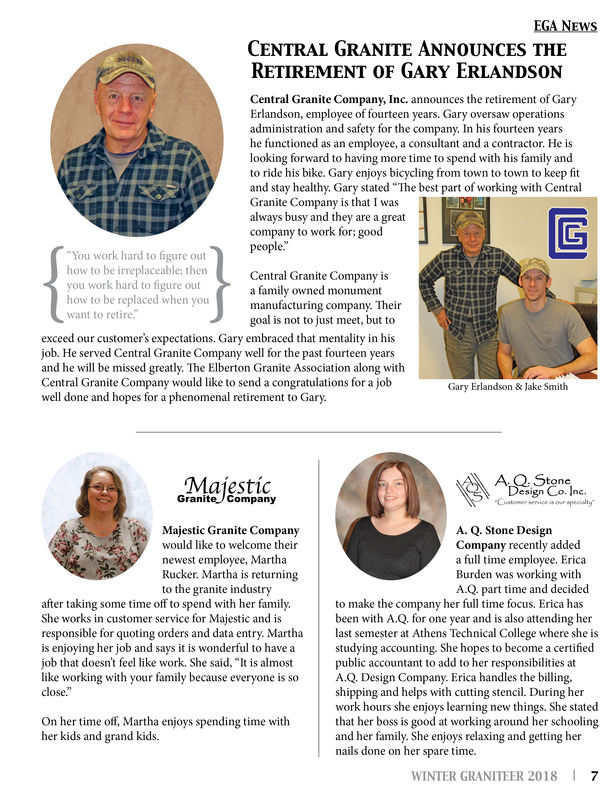 Gary stated “The best part of working with Central Granite Company is that I was always busy and they are a great company to work for; good people.” Central Granite Company is a family owned monument manufacturing company. Their goal is not to just meet, but to exceed our customer’s expectations. Gary embraced that mentality in his job. He served Central Granite Company well for the past fourteen years and he will be missed greatly. The Elberton Granite Association along with Central Granite Company would like to send a congratulations for a job well done and hopes for a phenomenal retirement to Gary. Majestic Granite Company would like to welcome their newest employee, Martha Rucker. Martha is returning to the granite industry after taking some time off to spend with her family. She works in customer service for Majestic and is responsible for quoting orders and data entry. Martha is enjoying her job and says it is wonderful to have a job that doesn’t feel like work. She said, “It is almost like working with your family because everyone is so close.” On her time off, Martha enjoys spending time with her kids and grand kids. A. Q. Stone Design Company recently added a full time employee. Erica Burden was working with A.Q. part time and decided to make the company her full time focus. Erica has been with A.Q. for one year and is also attending her last semester at Athens Technical College where she is studying accounting. She hopes to become a certified public accountant to add to her responsibilities at A.Q. Design Company. Erica handles the billing, shipping and helps with cutting stencil. During her work hours she enjoys learning new things. She stated that her boss is good at working around her schooling and her family. She enjoys relaxing and getting her nails done on her spare time. Bicknell Supply Rolls Out Their New Automatic Blast Curtain The technology of today continues to grow. More and more frequently, machinery is being updated and improved to include more technological features and less manual operation. Bicknell Supply Company, with the help of Wilson Industrial Electric, spent a great amount of time in 2018 updating their Automatic Blasting Curtain (ABC). The update included changes to the control panel with the addition of a digital touch screen with fewer manual buttons. The Automatic Blasting Curtain (ABC) designed, produced and sold by Bicknell Supply Company has put all of their components on the outside of the curtain to keep them out of the harsh conditions within the abrasive blasting room and extend the life of the actual curtains. The nozzle is always pointed squarely at the stone and is the only component that moves inside the room. When the components are built on the inside of the curtain, those components are subject to the abrasive that ricochets off of the stone during the blasting process. This causes unnecessary wear and tear on vital components and presents the risk of sand being left in the crevices, eventually stopping up the machine. The ABC from Bicknell Supply does not have this issue, as the only moving component inside the room is the nozzle used to blast the stone. The control box on the former model has been replaced with a new and improved touchscreen version making the dynamics of the control panel more user friendly and up to date. 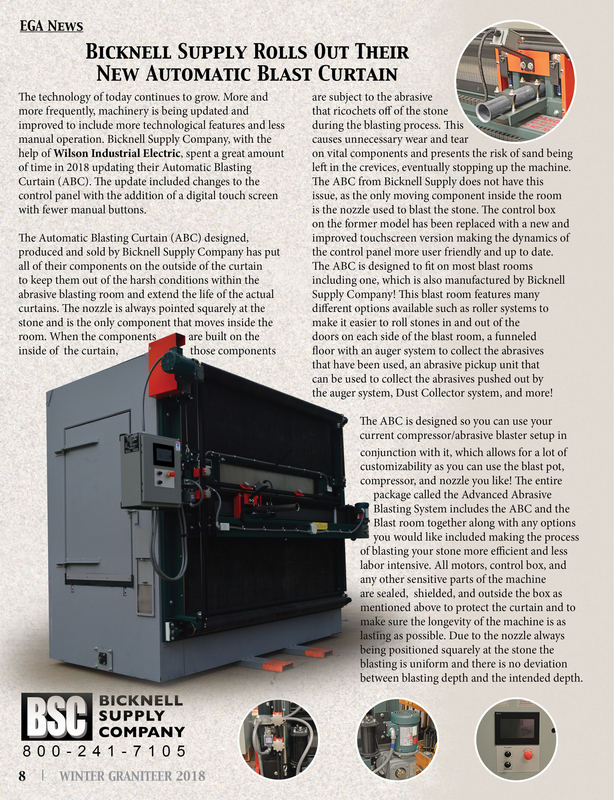 The ABC is designed to fit on most blast rooms including one, which is also manufactured by Bicknell Supply Company! This blast room features many different options available such as roller systems to make it easier to roll stones in and out of the doors on each side of the blast room, a funneled floor with an auger system to collect the abrasives that have been used, an abrasive pickup unit that can be used to collect the abrasives pushed out by the auger system, Dust Collector system, and more! The ABC is designed so you can use your current compressor/abrasive blaster setup in conjunction with it, which allows for a lot of customizability as you can use the blast pot, compressor, and nozzle you like! The entire package called the Advanced Abrasive Blasting System includes the ABC and the Blast room together along with any options you would like included making the process of blasting your stone more efficient and less labor intensive. All motors, control box, and any other sensitive parts of the machine are sealed, shielded, and outside the box as mentioned above to protect the curtain and to make sure the longevity of the machine is as lasting as possible. Due to the nozzle always being positioned squarely at the stone the blasting is uniform and there is no deviation between blasting depth and the intended depth. 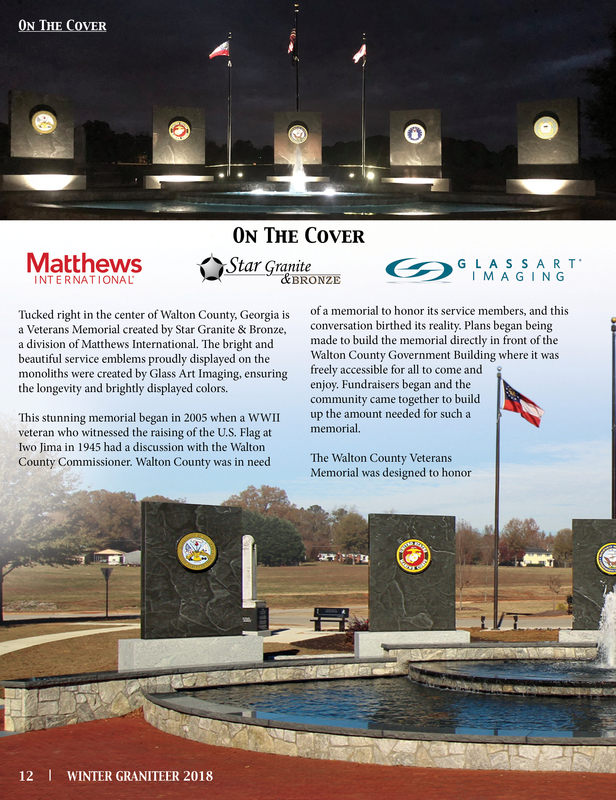 Tucked right in the center of Walton County, Georgia is a Veterans Memorial created by Star Granite & Bronze, a division of Matthews International. The bright and beautiful service emblems proudly displayed on the monoliths were created by Glass Art Imaging, ensuring the longevity and brightly displayed colors. This stunning memorial began in 2005 when a WWII veteran who witnessed the raising of the U.S. Flag at Iwo Jima in 1945 had a discussion with the Walton County Commissioner. Walton County was in need of a memorial to honor its service members, and this conversation birthed its reality. Plans began being made to build the memorial directly in front of the Walton County Government Building where it was freely accessible for all to come and enjoy. Fundraisers began and the community came together to build up the amount needed for such a memorial. 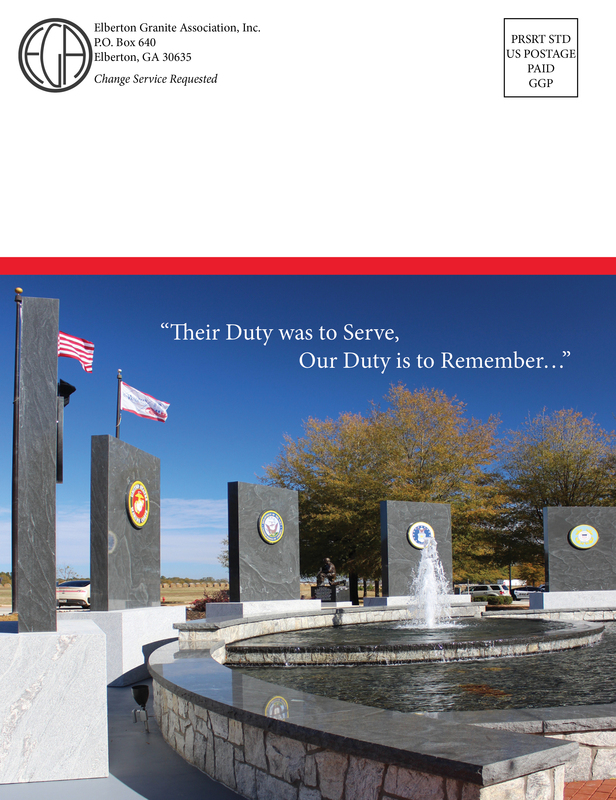 The Walton County Veterans Memorial was designed to honor the service of veterans and allow a place of reflection. The memorial includes five Jet Mist monoliths standing ten-feet tall atop their four-foot tall Silver Cloud bases. 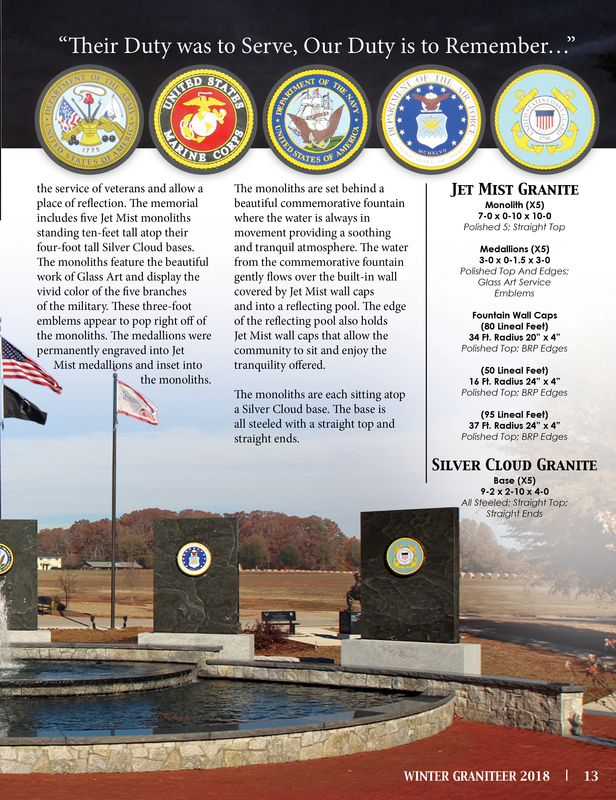 The monoliths feature the beautiful work of Glass Art and display the vivid color of the five branches of the military. These three-foot emblems appear to pop right off of the monoliths. The medallions were permanently engraved into Jet Mist medallions and inset into the monoliths. The monoliths are set behind a beautiful commemorative fountain where the water is always in movement providing a soothing and tranquil atmosphere. The water from the commemorative fountain gently flows over the built-in wall covered by Jet Mist wall caps and into a reflecting pool. The edge of the reflecting pool also holds Jet Mist wall caps that allow the community to sit and enjoy the tranquility offered. The monoliths are each sitting atop a Silver Cloud base. The base is all steeled with a straight top and straight ends. 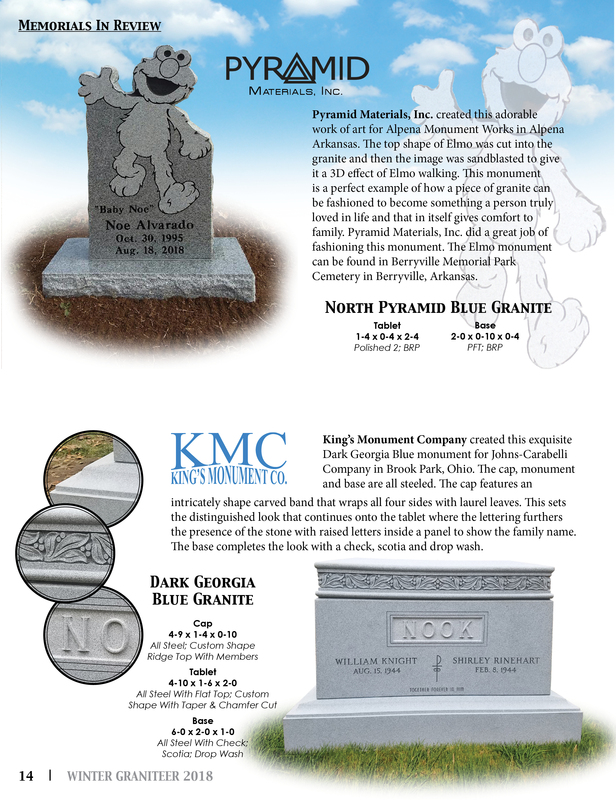 Pyramid Materials, Inc. created this adorable work of art for Alpena Monument Works in Alpena Arkansas. The top shape of Elmo was cut into the granite and then the image was sandblasted to give it a 3D effect of Elmo walking. This monument is a perfect example of how a piece of granite can be fashioned to become something a person truly loved in life and that in itself gives comfort to family. Pyramid Materials, Inc. did a great job of fashioning this monument. The Elmo monument can be found in Berryville Memorial Park Cemetery in Berryville, Arkansas. King’s Monument Company created this exquisite Dark Georgia Blue monument for Johns-Carabelli Company in Brook Park, Ohio. The cap, monument and base are all steeled. The cap features an intricately shape carved band that wraps all four sides with laurel leaves. This sets the distinguished look that continues onto the tablet where the lettering furthers the presence of the stone with raised letters inside a panel to show the family name. The base completes the look with a check, scotia and drop wash. This phenomenal piece of art was etched by Jenson Etching using the hand etch method. Hand etching is a process where the artists will sit down with a blank stone and using a hand held tool with a diamond tip would scratch the surface of the stone to create a photograph, piece of art or scene onto the stone. Hand etching is a unique way to personalize the monument of a loved one as well as public monuments and war memorials. The art of hand etching can be dated back thousands of years to prehistoric times when images were scratched into the surface of rock walls and caves as a means to preserve events and memories. Jenson Etching is a leader of this fine art here in Elberton, Georgia. They have been in business for over 20 years. 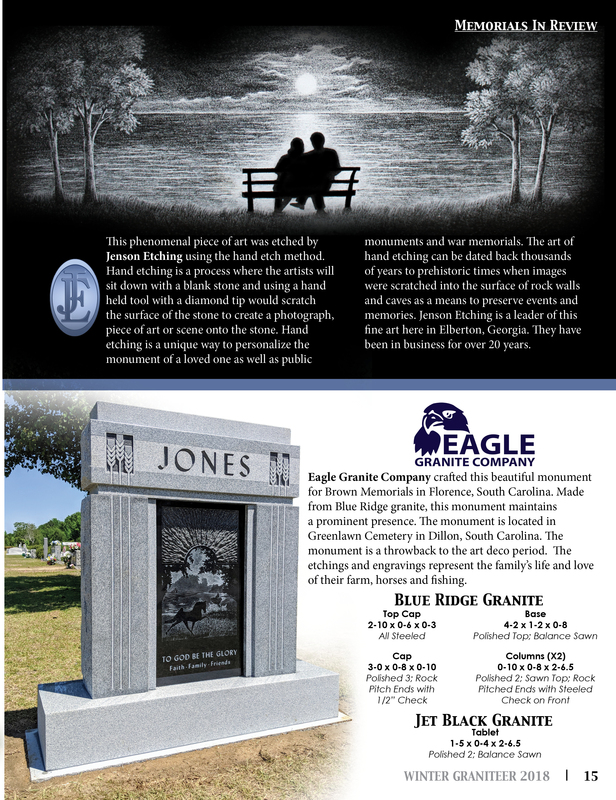 Eagle Granite Company crafted this beautiful monument for Brown Memorials in Florence, South Carolina. 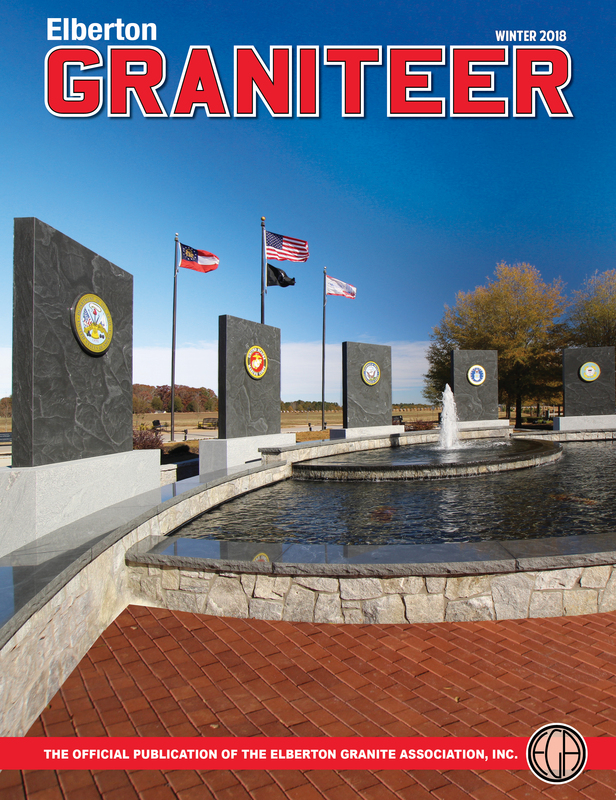 Made from Blue Ridge granite, this monument maintains a prominent presence. The monument is located in Greenlawn Cemetery in Dillon, South Carolina. The monument is a throwback to the art deco period. The etchings and engravings represent the family’s life and love of their farm, horses and fishing. Eagle Granite Company made this monument for Schultz Monument Company in Madison, Tennessee. It is a replication of a family memorial that was erected in the 1870’s in Grand Rapids, Michigan. Great detail was taken to make sure the family crest and design was exactly as close to the original as possible. From the sleek lines of the drop wash to the raised carved letters to the curved rounded top, Eagle Granite did a fabulous job making this monument be everything that the family wanted. King’s Monument Company created this stunning monument for Wenta Monument Company in Milwaukee, Wisconsin. Two tablets were placed side-by-side to form a spectacular cutout cross that adds dimension and depth to the monument and feature a half gable on top. They are each polished on the front, back and outside edge while steeled on the inside with a steeled notch cut to simulate the cross. Jenson Etching etched the beautiful family tree on the front of the right tablet. The Sub base is also all polished and features a beautiful portrait etched of Mrs. Dore while the base has a polished top with rock pitched sides. This monument can be found in Calvary Cemetery in Kawkawlin, Michigan. 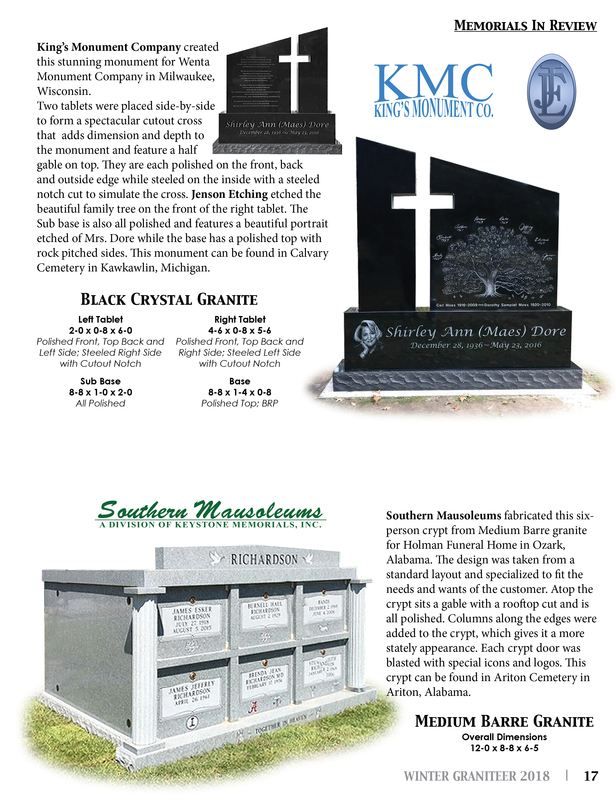 Southern Mausoleums fabricated this six-person crypt from Medium Barre granite for Holman Funeral Home in Ozark, Alabama. The design was taken from a standard layout and specialized to fit the needs and wants of the customer. Atop the crypt sits a gable with a rooftop cut and is all polished. Columns along the edges were added to the crypt, which gives it a more stately appearance. Each crypt door was blasted with special icons and logos. This crypt can be found in Ariton Cemetery in Ariton, Alabama. 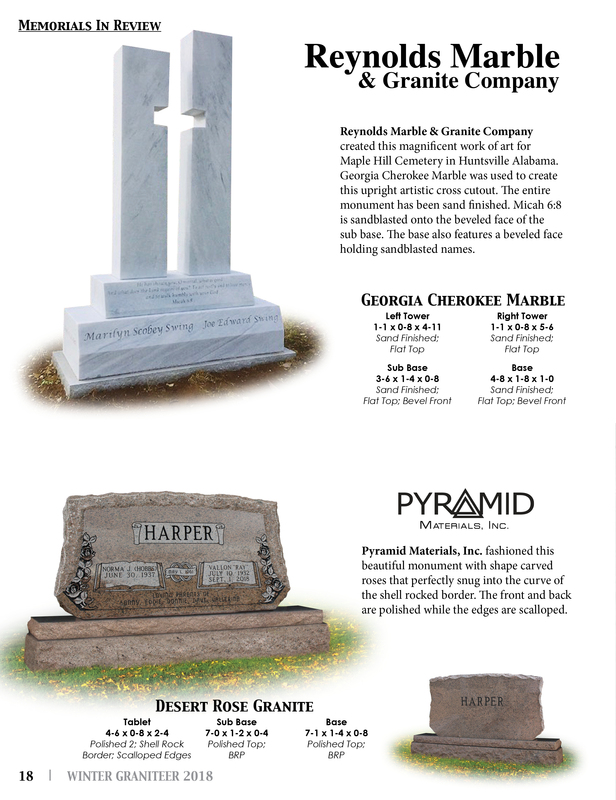 Reynolds Marble & Granite Company created this magnificent work of art for Maple Hill Cemetery in Huntsville Alabama. Georgia Cherokee Marble was used to create this upright artistic cross cutout. The entire monument has been sand finished. Micah 6:8 is sandblasted onto the beveled face of the sub base. The base also features a beveled face holding sandblasted names. Pyramid Materials, Inc. fashioned this beautiful monument with shape carved roses that perfectly snug into the curve of the shell rocked border. The front and back are polished while the edges are scalloped. Keystone Memorials, Inc. created this spectacular tribute to the late Christian theologian author, C.S. Lewis, for Certified Palmetto Bug Casting in Camden, South Carolina. 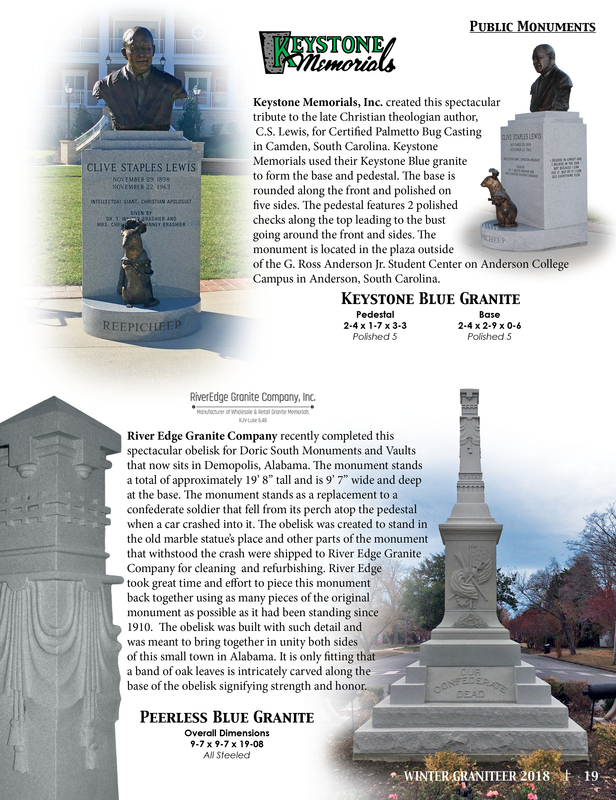 Keystone Memorials used their Keystone Blue granite to form the base and pedestal. The base is rounded along the front and polished on five sides. The pedestal features 2 polished checks along the top leading to the bust going around the front and sides. The monument is located in the plaza outside of the G. Ross Anderson Jr. Student Center on Anderson College Campus in Anderson, South Carolina. River Edge Granite Company recently completed this spectacular obelisk for Doric South Monuments and Vaults that now sits in Demopolis, Alabama. The monument stands a total of approximately 19’ 8” tall and is 9’ 7” wide and deep at the base. The monument stands as a replacement to a confederate soldier that fell from its perch atop the pedestal when a car crashed into it. The obelisk was created to stand in the old marble statue’s place and other parts of the monument that withstood the crash were shipped to River Edge Granite Company for cleaning and refurbishing. River Edge took great time and effort to piece this monument back together using as many pieces of the original monument as possible as it had been standing since 1910. The obelisk was built with such detail and was meant to bring together in unity both sides of this small town in Alabama. It is only fitting that a band of oak leaves is intricately carved along the base of the obelisk signifying strength and honor. Willis Dimension Stone Steps Up The Game With The Quarry Pump House Building The possibilities of what can be made using the beautiful granite quarried out of Elberton, Georgia appear to be endless. 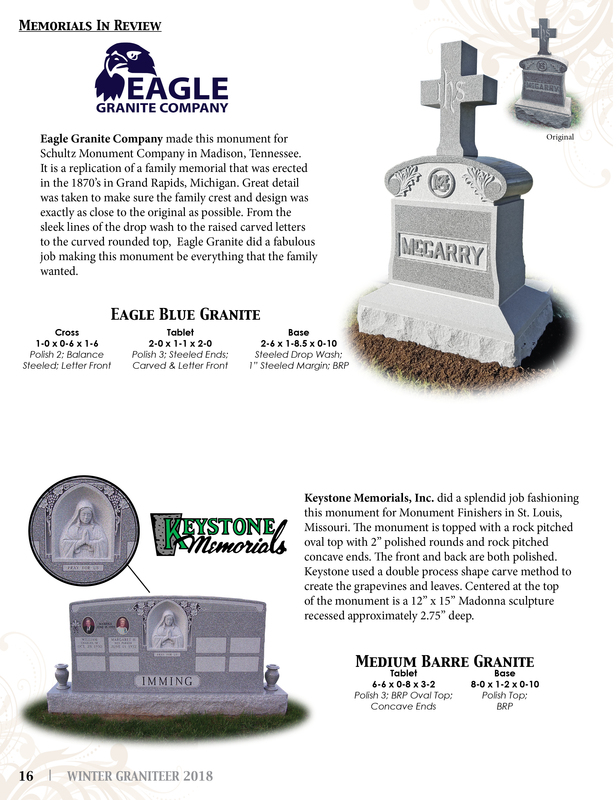 From monuments and memorials, to veterans’ parks, counter tops, curbing, landscaping stones to buildings. Yes, even buildings are being made using the granite located in Elberton. Right here in this small town are several homes, offices and churches using our fine granite for their construction. However, the caliber of possibilities was stretched in 2018 when Willis Dimension Stone set to the task of using Savannah Gray granite from their quarry to fabricate a massive project in the city of Atlanta. 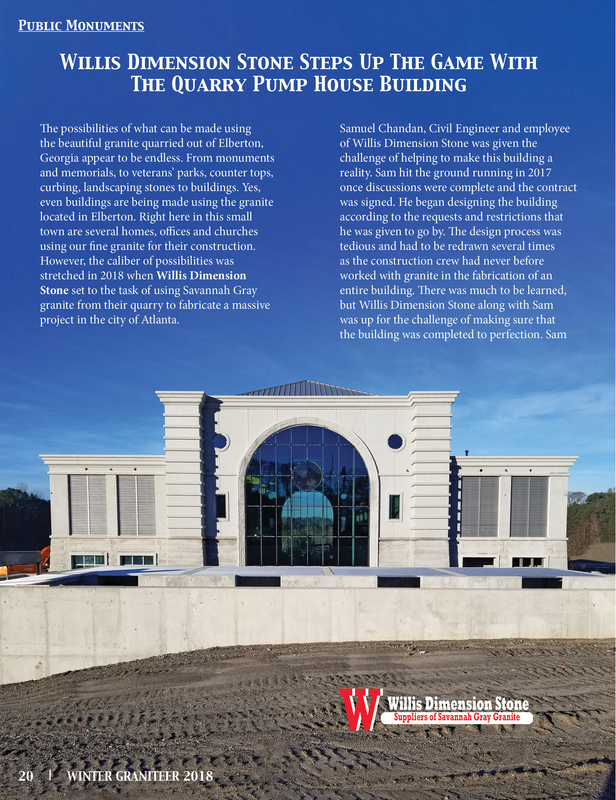 Samuel Chandan, Civil Engineer and employee of Willis Dimension Stone was given the challenge of helping to make this building a reality. Sam hit the ground running in 2017 once discussions were complete and the contract was signed. He began designing the building according to the requests and restrictions that he was given to go by. The design process was tedious and had to be redrawn several times as the construction crew had never before worked with granite in the fabrication of an entire building. There was much to be learned, but Willis Dimension Stone along with Sam was up for the challenge of making sure that the building was completed to perfection. Sam met with the construction board weekly to ensure that the customer was happy with the progress and that things were run smoothly. In 2018, construction began. Due to OSHA regulations, there were some difficulties that had to be overcome. Each block of granite was required to be cut and finished prior to shipping to the construction site. No blocks could be altered on site. This meant that very close attention had to be paid to each and every detail to ensure that when the construction crew began putting the blocks together, they fit into place without flaw. 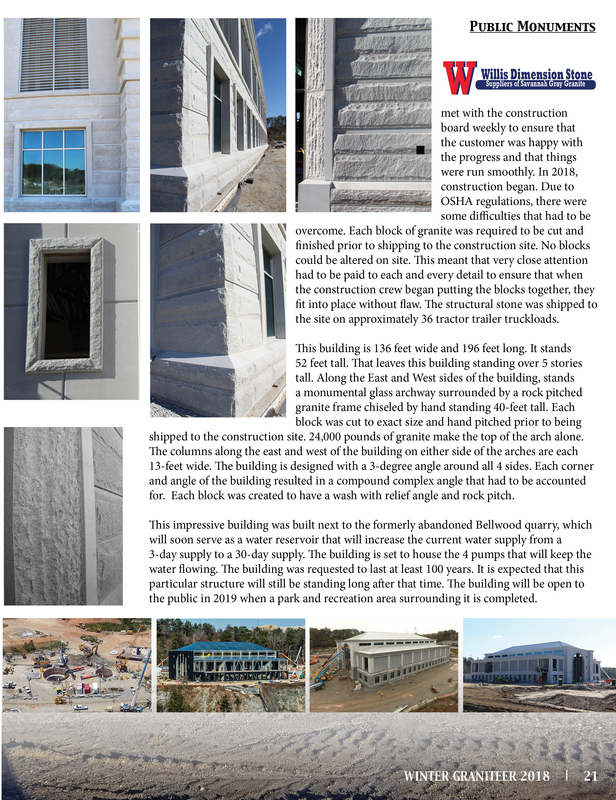 The structural stone was shipped to the site on approximately 36 tractor trailer truckloads. This building is 136 feet wide and 196 feet long. It stands 52 feet tall. That leaves this building standing over 5 stories tall. Along the East and West sides of the building, stands a monumental glass archway surrounded by a rock pitched granite frame chiseled by hand standing 40-feet tall. Each block was cut to exact size and hand pitched prior to being shipped to the construction site. 24,000 pounds of granite make the top of the arch alone. The columns along the east and west of the building on either side of the arches are each 13-feet wide. The building is designed with a 3-degree angle around all 4 sides. Each corner and angle of the building resulted in a compound complex angle that had to be accounted for. Each block was created to have a wash with relief angle and rock pitch. This impressive building was built next to the formerly abandoned Bellwood quarry, which will soon serve as a water reservoir that will increase the current water supply from a 3-day supply to a 30-day supply. The building is set to house the 4 pumps that will keep the water flowing. The building was requested to last at least 100 years. It is expected that this particular structure will still be standing long after that time. The building will be open to the public in 2019 when a park and recreation area surrounding it is completed. 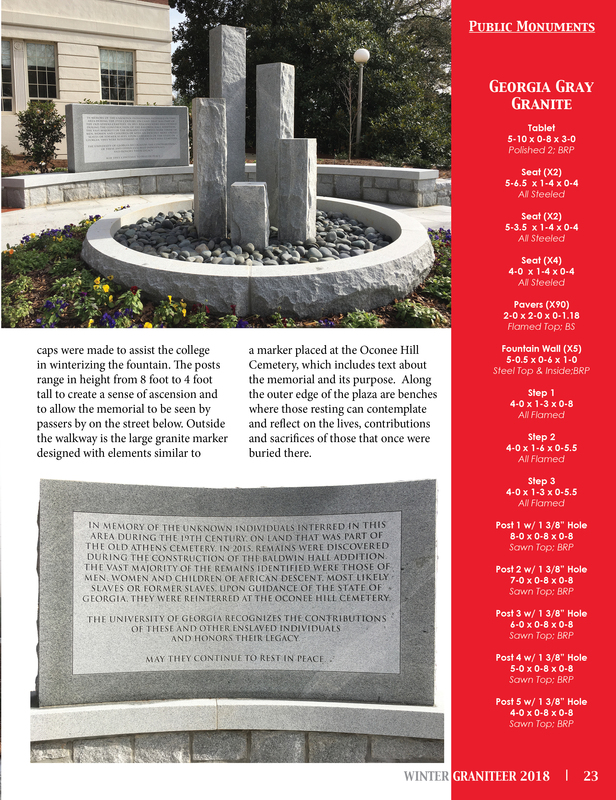 Matthews International Works with The University Of Georgia To Create The Baldwin Hall Memorial Fountain And Reflection Plaza In November of 2015, the remains of individuals were discovered during the construction of the addition to Baldwin Hall on the UGA campus in Athens, Georgia. In an effort to commemorate the lives of those found, the University held a memorial ceremony and reinterred their remains at Oconee Hill Cemetery. A place to build a memorial was set-aside outside of Baldwin Hall to honor those lives. The memorial, located on the south end of the front lawn of Baldwin Hall, now serves as a place of meaningful reflection and remembrance for the individuals who were originally buried on this site in the 1800s. The new memorial was dedicated November 16th, 2018. Matthews Granite, owned by Matthews International, built this beautiful plaza where students can reflect. 35,000 pounds of granite was donated by a local family owning a quarry in Oglethorpe County and was used in the creation of this beautiful plaza. 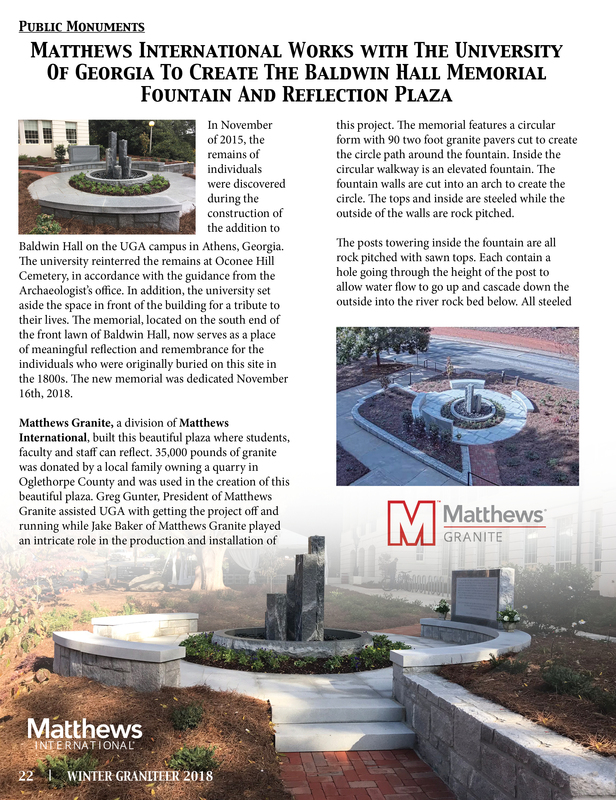 Greg Gunter, President of Matthews Granite assisted UGA with getting the project off and running while Jake Baker of Matthews Granite played an intricate role in the production and installation of this project. The memorial features a circular form with 90 two foot granite pavers cut to create the circle path around the fountain. Inside the circular walkway is an elevated fountain. The fountain walls are cut into an arch to create the circle. The tops and inside are steeled while the outside of the walls are rock pitched. The posts towering inside the fountain are all rock pitched with sawn tops. Each contain a hole going through the height of the post to allow water flow to go up and cascade down the outside into the river rock bed below. All steeled caps were made to assist the college in winterizing the fountain. The posts range in height from 8 foot to 4 foot tall to create a sense of ascension and to allow the memorial to be seen by passers by on the street below. Outside the walkway is the large granite marker designed with elements similar to the marker at the Oconee Cemetery, which includes text about the memorial and its purpose. Along the outer edge of the plaza are benches where those resting can contemplate and reflect on the lives, contributions and sacrifices of those that once lay beneath. 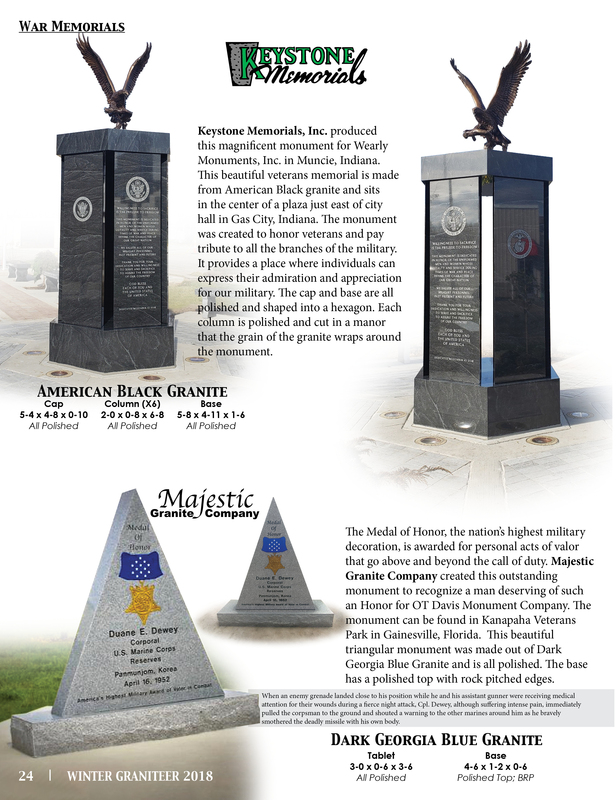 Keystone Memorials, Inc. produced this magnificent monument for Wearly Monuments, Inc. in Muncie, Indiana. This beautiful veterans memorial is made from American Black granite and sits in the center of a plaza just east of city hall in Gas City, Indiana. The monument was created to honor veterans and pay tribute to all the branches of the military. It provides a place where individuals can express their admiration and appreciation for our military. The cap and base are all polished and shaped into a hexagon. Each column is polished and cut in a manor that the grain of the granite wraps around the monument. The Medal of Honor, the nation’s highest military decoration, is awarded for personal acts of valor that go above and beyond the call of duty. Majestic Granite Company created this outstanding monument to recognize a man deserving of such an Honor for OT Davis Monument Company. The monument can be found in Kanapaha Veterans Park in Gainesville, Florida. This beautiful triangular monument was made out of Dark Georgia Blue Granite and is all polished. The base has a polished top with rock pitched edges. When an enemy grenade landed close to his position while he and his assistant gunner were receiving medical attention for their wounds during a fierce night attack, Cpl. Dewey, although suffering intense pain, immediately pulled the corpsman to the ground and shouted a warning to the other marines around him as he bravely smothered the deadly missile with his own body.